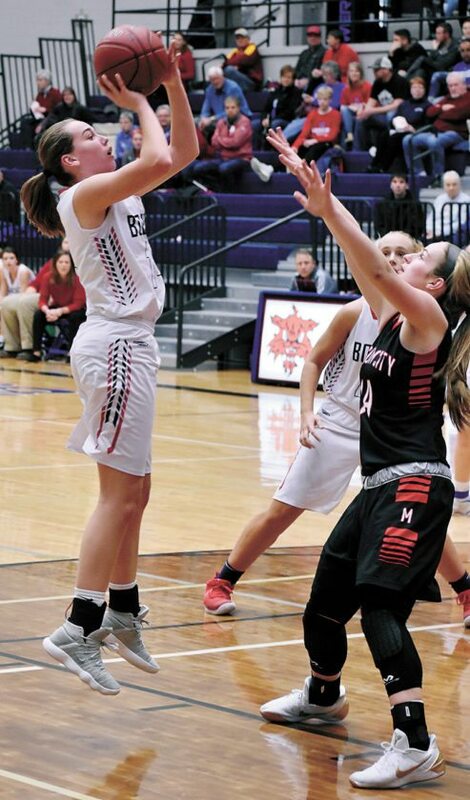 T-R PHOTO BY THORN COMPTON • Marshalltown senior Grace Metzger (44) boxes out her opponent while locking down a rebound during the second half of the Bobcats’ loss to Mason City on Friday night at the Roundhouse. So far this season, it’s been clear that the Marshalltown girls basketball team performs best when it gets out to a good start and doesn’t allow teams to jump out to an early lead. That was the plan heading into Friday’s home matchup against CIML Iowa Conference foe Mason City, but that plan didn’t quite work out as the Mohawks owned a 19-2 lead after the first quarter on their way to beating the Bobcats 57-23. MHS head coach Stacy O’Hare said slow starts have become common for her girls over the last few games, and that is not a recipe for success. To their credit, the Marshalltown girls never lacked for effort on the night, and that showed after the awful start on Friday. 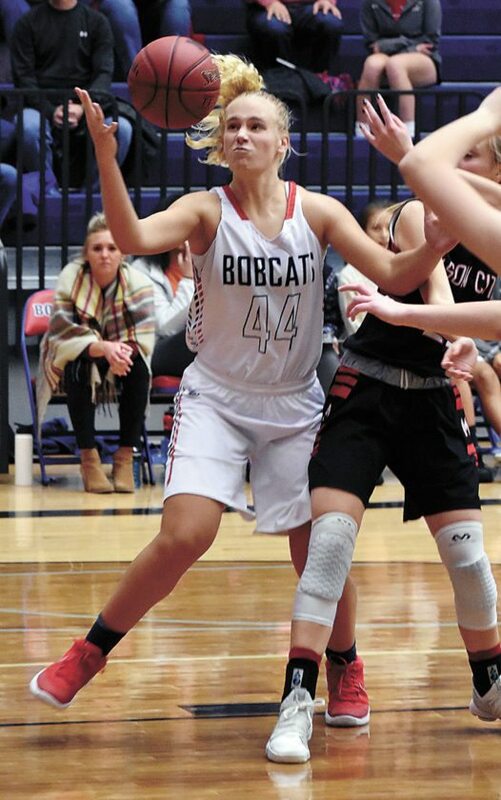 After allowing 19 points in each of the first two quarters, the Bobcats (1-6, 0-2) held Mason City (4-5, 1-1) to just 19 total points in the second half, and O’Hare said she is proud of the way her team fights to the end. T-R PHOTO BY THORN COMPTON • Marshalltown junior Alyvia Chadderdon, left, takes the ball inside the paint on Mason City defender Sami Miller during the Bobcats’ loss to the Mohawks on Friday. 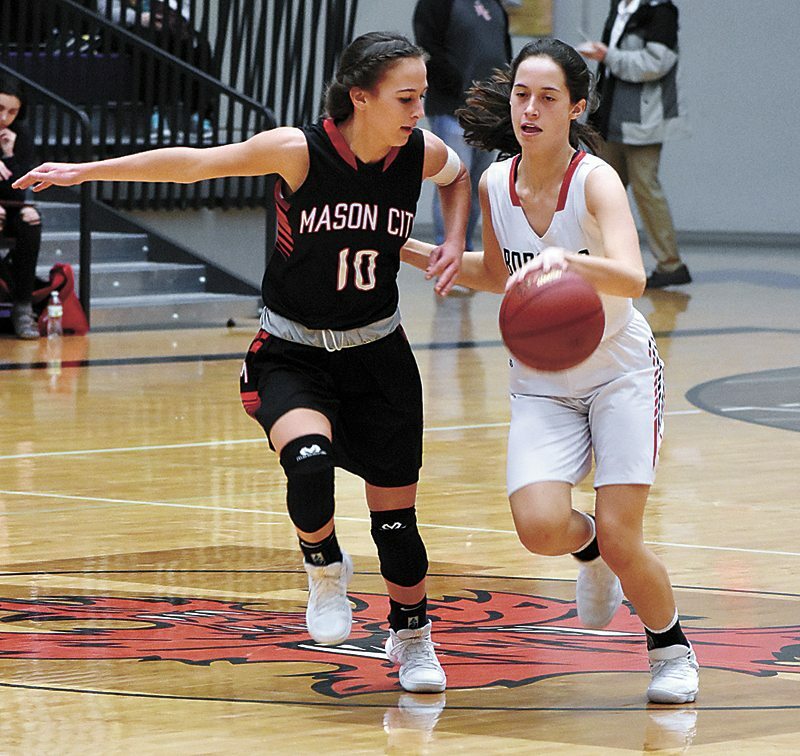 Mason City was led by Megan Meyer on the night with 17 points, but outside of the Mohawks’ leading scorer no other player had more than seven points. O’Hare said her girls knew that Meyer and Hannah Faktor were the main Mason City threats, but considering nine other girls found the bottom of the net for the Mohawks, shutting down just those two wasn’t really an option. What also didn’t do the Bobcats a lot of good was turning the ball over 25 times, many of those unforced due to traveling or carrying violations. O’Hare said those errors come from her girls being pressured, but they need to figure out how to handle that pressure because teams won’t be stopping the pressure any time soon. It wasn’t all bad for the MHS girls on Friday night, however, as O’Hare said two specific girls showed well on the day. Finch had five points and Metzger four in the loss, while Erica Johnson and Alyvia Chadderdon each had six to lead the Bobcats. There are just two games left on the schedule before winter break for Marshalltown now, starting with a matchup with Ottumwa on the road on Monday. O’Hare said the Bulldogs are known for their physical style of play, so the pressure they’ve seen could be taken to the next level. That game between Marshalltown and Ottumwa is set for a 6:15 p.m. tip on Monday at Ottumwa. 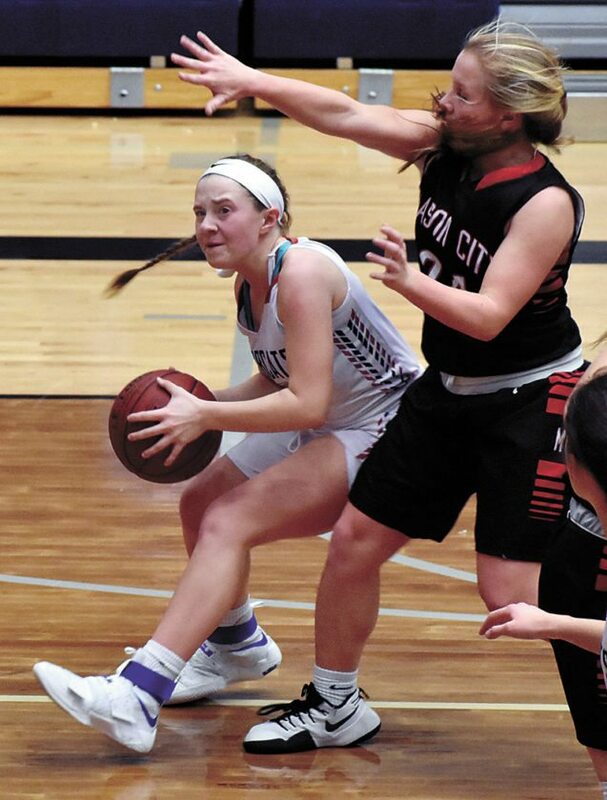 MASON CITY (4-5, 1-1) — Autum Anderson 3 0-0 7, Megan Meyer 7 1-1 17, Anna Lensing 2 0-0 4, Anna Deets 2 0-0 5, Ali Rood 0 1-2 1, Hannah Faktor 2 1-2 6, Sami Miller 1 0-2 2, Jaeda Whitner 2 0-0 5, Hannah Thomas 0 1-2 1, Brianna Notermann 0 0-0 0, Emma Hollander 2 0-0 4, Megan Hollander 2 1-4 5. TOTALS 23 5-13 57. MARSHALLTOWN (1-6, 0-2) — Alyvia Chadderdon 2 2-4 6, Erica Johnson 3 0-2 6, Madi Finch 0 4-6 4, Kassy Vest 1 0-0 2, Grace Metzger 2 0-1 4, Kyra Feldman 0 0-0 0, Aida Almanza 0 0-0 0, Priscila Vergara 0 0-0 0, Gabby Himes 0 0-0 0. TOTALS — 8 7-14 23. 3-Point Goals–MC 4 (Meyer, Rood, Faktor, Whitner). Total Fouls–MC 16, MHS 11. Fouled Out–none.